Google under new parent company Alphabet will start work today. Google Inc. on YouTube video that its reorganization as Alphabet will be finalized officially by the close of business today, and its stock will begin trading as Alphabet on the Nasdaq under the same tickers “GOOG” and “GOOGL” on Monday. Each share of Google will be automatically converted to Alphabet stock. In short Google will still exist, but as a subsidiary to the new parent company. It will be run by CEO Larry Page and President Sergey Brin, Google’s co-founders. The core Google business will continue to exist, operating under its own name and focusing on products like search, email, the YouTube video service and Android mobile software. 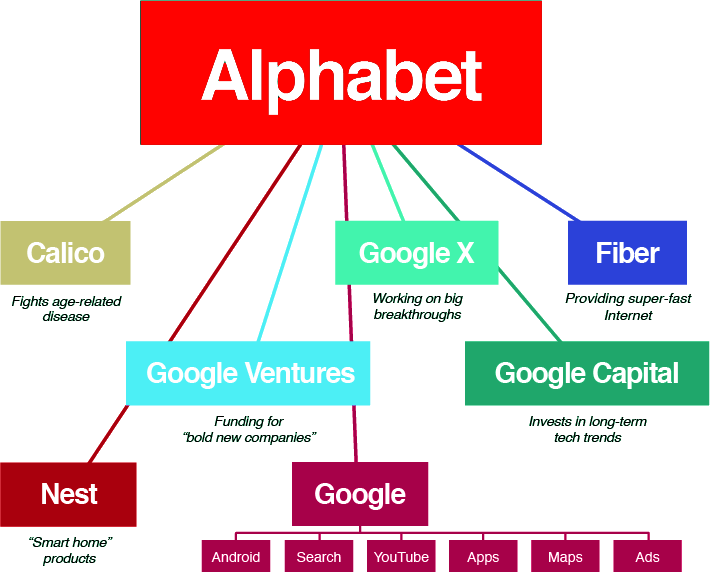 Google will now coexist under Alphabet with other units such as Google X, the experimental research lab; the Life Sciences unit looking into technologies such as glucose-sensing contact lenses; and the Calico life-extending initiative. Google becomes Alphabet could help Google focus on a few areas of its own, including the continued nurturing of YouTube and Android, which dominate their respective fields. Sundar Pichai, who handled much of the product operations prior to the reorganization, will be the new CEO of Google.